My longest and hottest ride yet. At times, the air temp on my bike's dash read 106 degrees! Good thing I brought plenty of water - some of which went straight down the front of my shirt. 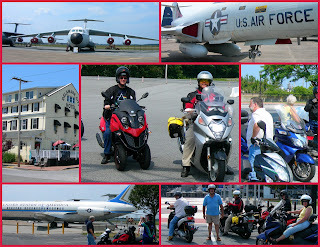 I didn't sacrifice comfort for safety - still had on my protective gear (boots, armored jacket and helmet, of course). Seven from our EZRiders Scooter Club met at Lucky's Coffee Shop in Talleyville, Delaware, just north of Wilmington. Then we rode about an hour to eat an early lunch at Crabby Dicks at the Delaware City Hotel. I was the only one who ordered Crabby Dicks famous Crab Balls. After a leisurely lunch, it was on to the Museum, another hour long twisty ride along the Delaware bay. There's plenty to see in the Air Mobility Museum. I even climbed into Air Force 2 (now retired) and saw the last airborne lair of VP Cheney. Our club's very experienced ride leader was Hammy - thanks for a great ride! View the Google map of our route, almost 180 miles round trip for me.